His 2018 book The Future of Humanity explores the possibilities of humans leaving earth to colonize other planets. Clearly written for an audience with one foot in science and one foot in science fiction, Kaku has a breezy style that is easy to read and carries you along. He quotes from theoretical physicists and NASA astronomers, then switches effortlessly to recaps of Star Trek episodes and references to visionary works by Jules Verne and Olaf Stapledon, among others. He looks at both the possibilities and the pitfalls of living beyond our comfortable planet. Could we survive long-term in an environment we were not evolved for? Could we “terraform” another planet? What would it take to make Mars (or any other planet) livable? What are the possibilities and potentials beyond our solar system? How could we get there? Is there intelligent life beyond our solar system? If so, could we coexist? Could we even communicate? Kaku’s The Future of Humanity also looks at colonizing space through unexpected means. If we find that the speed of light is indeed insurmountable (which is a depressing implication of Einstein’s Theory of Relativity), can we send multi-generational ships? If so, how could we guarantee that those great-grandchildren of the pioneers were willing and able to colonize a new planet when they arrived? What are the ethics of sending, say, 200 people from earth who would give birth to children that would live and die on board a ship, and expect that some 250 years later their descendants would be expected to colonize a world they likely knew little to nothing about? What kind of governance would be required to assure the ship-dwellers neither had too many, nor too few, children? Kaku may be a physicist, but his questions and explorations are deeply rooted in a very humanistic ethic. What if we were able to extend life indefinitely–would a 250-year journey be worth making if we lived 1000 years? Or, what if we could upload our consciousness to a machine which would make the journey? Or genetically modify our descendants to live in inhospitable environments? What would it mean to humanity if our galactic descendants no longer looked like us physically–or were no longer even made of the same organic stuff that we consider essential to life? The Future of Humanity definitely walks the line between science fact and science fiction. It does clearly show where science is right now. If we were to try to colonize Mars tomorrow, we would likely fail. Fifty years from now? It is quite likely the tools will be available. Whether the will and the money will be available is a much dicier proposition, and Kaku acknowledges that. But insert enough time, enough scientific progress, and enough environmental pressure on earth from climate change and overpopulation, and the equation may change. Mars may look very attractive in 200 years when compared to a polluted, crowded, hotter earth. Kaku is not necessarily a pessimist, though, when it comes to earth. He acknowledges that birth rates are slowing, that there are reasons to hope for a cleaner tomorrow, and that climate change has uncertain consequences. Earth itself may not be such a bad place in 200 years. And his vision of an inhabitable solar system relies heavily on technologies that are little more than dreams in visionaries’ minds. For a book of scientific fact, there is a significant amount of hopeful speculation. Someday we might look back at this book in amazement at the technological breakthroughs it foresaw. Or, as we did in 2015, we may be asking ourselves why “Back to the Future” hoverboards aren’t parked in our garages. Science can be both hopeful and hopeless. 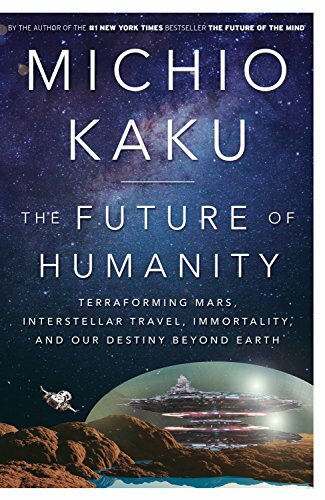 Kaku’s book envisions a very hopeful future, one where we colonize first the solar system and then the galaxy, one where humanity has a future in the stars for even millions of years. Eventually, though, it will all end. Science is divided on whether it all ends with the galaxy collapsing upon itself in a spectacular reversal of the “big bang,” or whether it ends with the second law of thermodynamics winning and everything just running out of energy and freezing, but either way we may only have several billion years left to prepare ourselves for our eventual end. Somehow, though, even though our earth may burn up in an expanding sun sometime around 5 billion years from now, and even though the universe as a whole will end some unknown billion years after that, Kaku seems to find reasons to hope that humanity has a bright future among the stars. Leave it to a theoretical physicist to remind us that the universe will eventually end. At least, though, we have still some time to prepare for that.